Eggs cooked slowly over the stove until soft and fluffy. 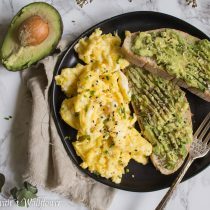 Topped with everything spice, these slow scrambled eggs are perfect on their own or served with toast. It’s back to basics today. 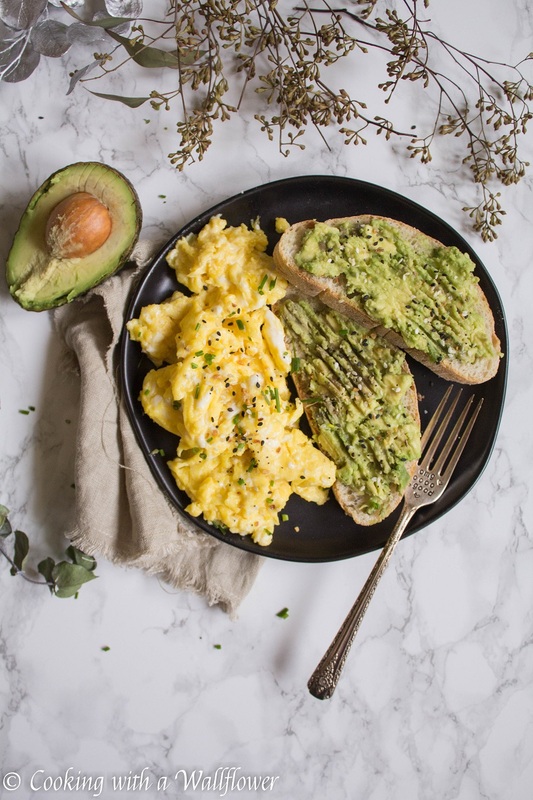 I know you’re wondering why I’m sharing scrambled eggs of all things, but if you haven’t had slow scrambled eggs, you’re definitely missing out. They’re the softest and fluffiest and soo delicious. Did you know that 11 years ago I couldn’t even crack an egg? At least, not properly. Any egg I cracked meant that I had to fish tiny little shells out of the bowl. It was a pain. lol. Who knew that five years later I would decide to start a food blog. It would definitely not work out at all if I couldn’t crack eggs. 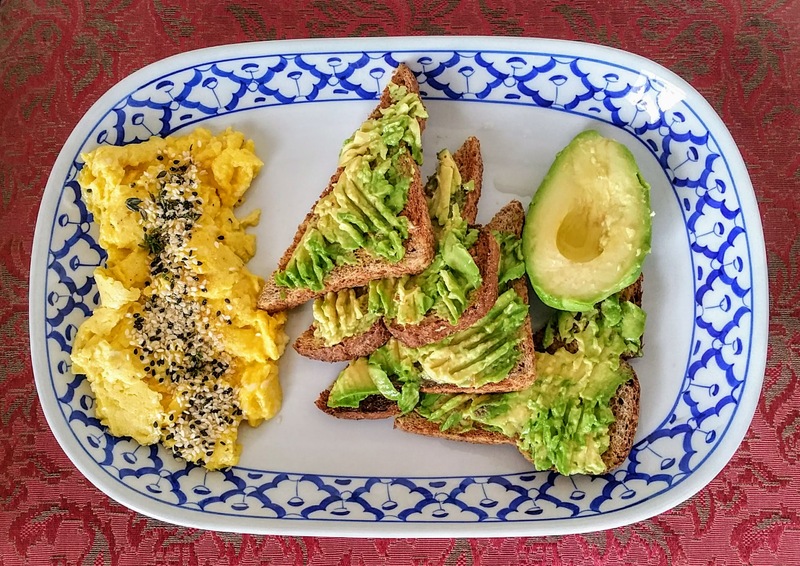 No baked goods, no poached eggs for toast, no slow scrambled eggs. My life would be incomplete. lol. 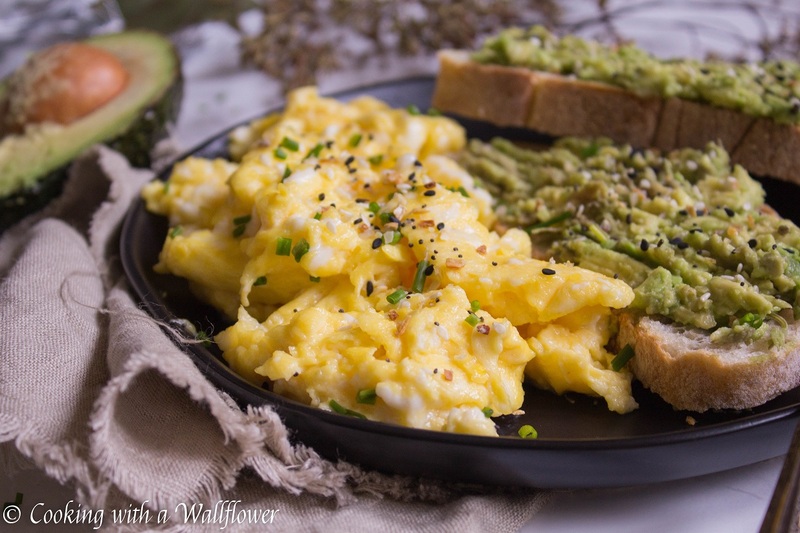 But in all seriousness, if you’ve never slow scrambled eggs before, you do need to try it. I was never really one for scrambled eggs. It didn’t really hold any appeal for me. 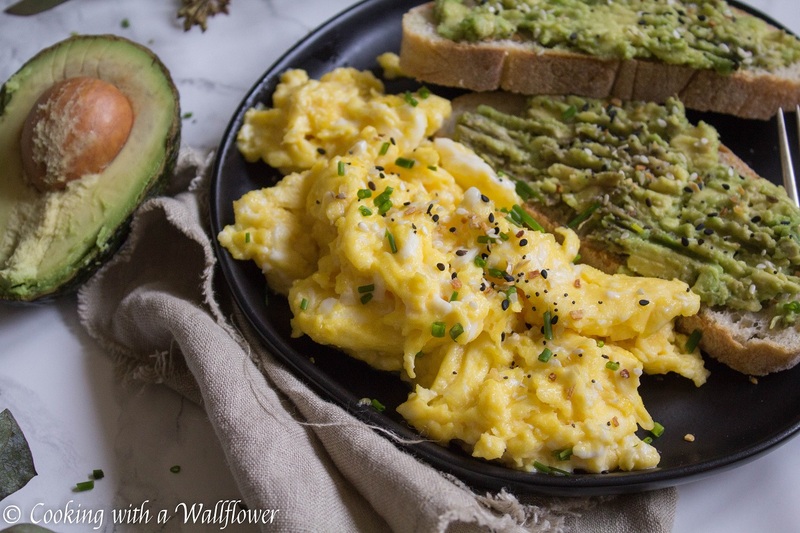 But once I tried them slow scrambled, it’s now one of my favorite ways of eating eggs. 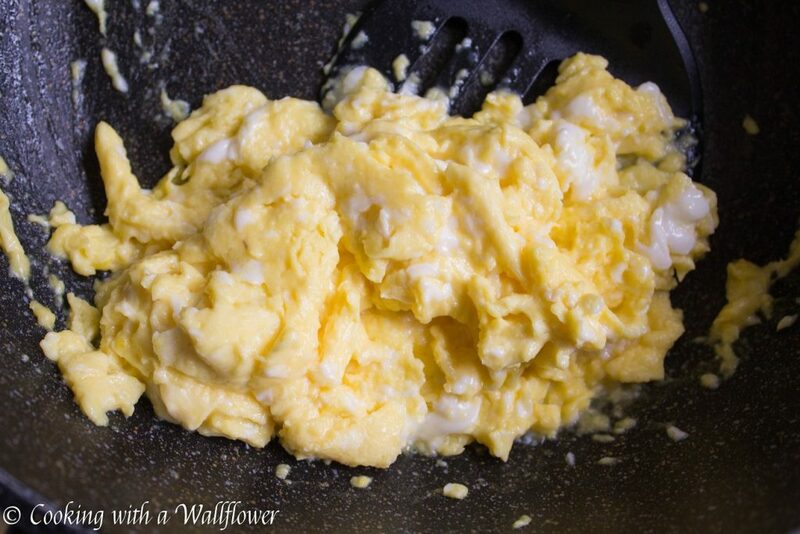 Slow scrambled eggs are eggs that are mixed with a little bit of heavy cream and then cooked slowly over low heat. It does take a little longer to make, but I promise you that the result is completely worth it. 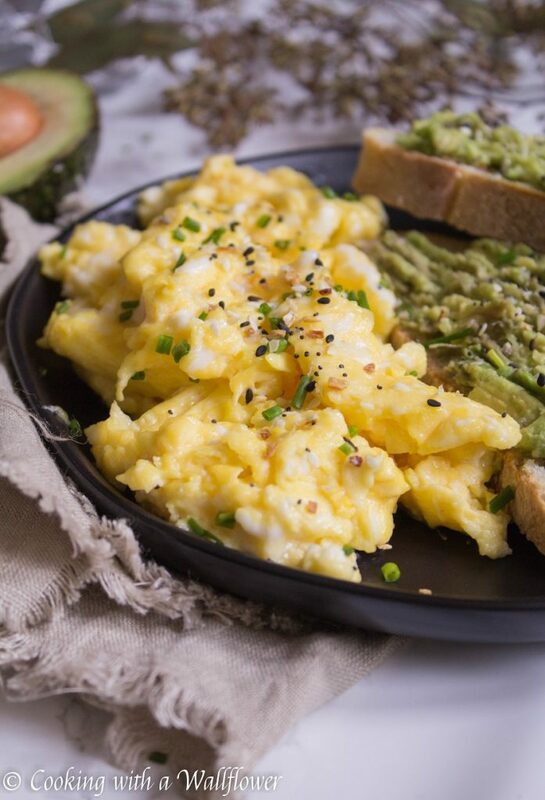 Every bite of these slow scrambled eggs are soft and luscious. They’re fluffy and sooo delicious. I seriously want them on toast, in breakfast sandwiches, by themselves. And I think you will too. Especially if it’s topped with everything spice. And served with avocado toast. Whisk eggs with heavy cream and a pinch of salt until well incorporated. Add olive oil to a nonstick skillet over low heat. Slowly pour the egg mixture into the skillet. Use a spatula or a wooden spoon to push the egg around until the eggs are cooked to your liking, about 6 minutes. 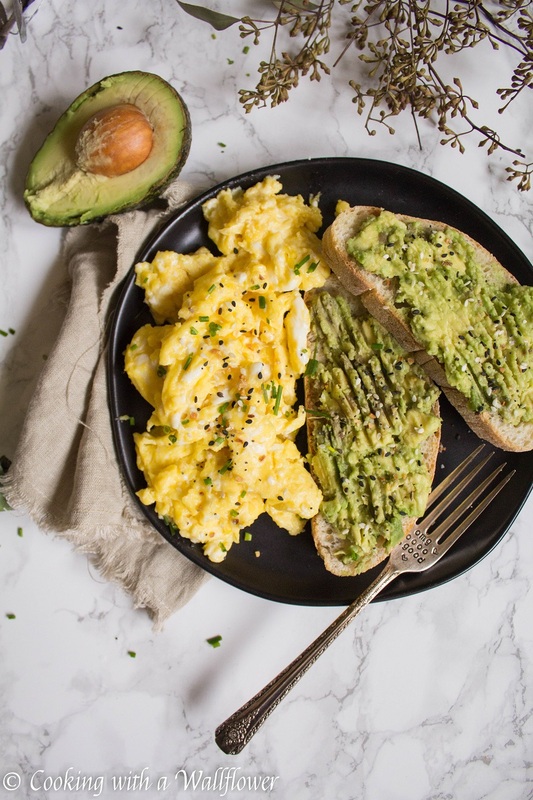 Serve the slow scrambled eggs with everything spice and a side of avocado toast. 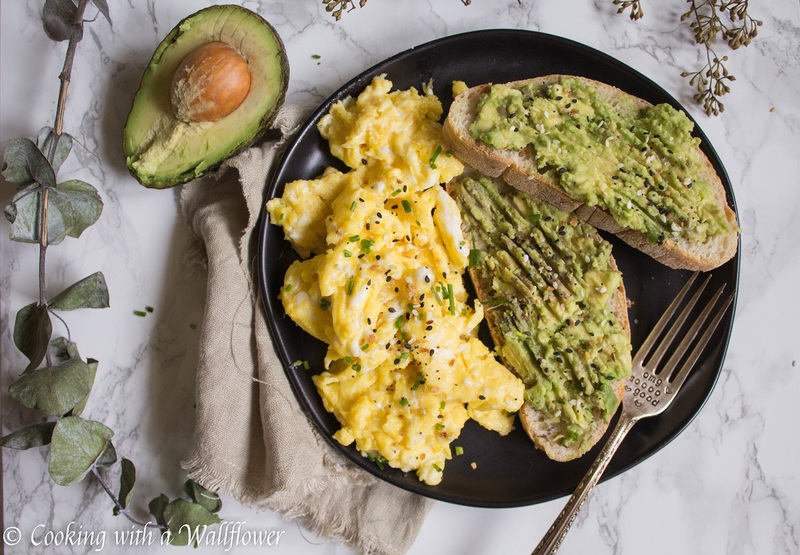 This entry was posted in Avocado Toast, Breakfast, Entree, Farmer's Market, Healthy, Quick and Easy, Recipes, Vegetarian and tagged avocado toast, breakfast, brunch, quick and easy, scrambled eggs, vegetarian. Adding the whipping cream to our scrambled eggs with chives was amazing this morning, I’ll will always include it from now on! I didn’t have everything spice, one day I’ll try adding that too! It looks amazing. I’m so glad you liked it! I have all these ingredients on hand right now. I am going to make this for my breakfast tomorrow. 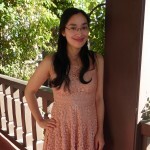 I don’t know how to post a photo to comments. Do you? I could them post a photo of my recreation. I like to use my immersion blender to whip the eggs until the are good and fluffy. I pour them into hot coconut oil and just told them until done. Because I share my eggs with my dog ( he’s a little spoiled) I don’t add the spices until after I portion them out. I’ll have to try it this way. I love everything spice on everything!